Do Zechariah's words mean the desolation continued? Zechariah: Did the seventy years continue? There is yet another way some try to explain away their unworkable secular chronology. Some are aware of the problems in placing the start of the 70 years at an earlier time, namely 20 years before Jerusalem was destroyed. Hence, instead they make a different claim: that the 70 years of desolation ended 20 years after Jerusalem became re-inhabited! 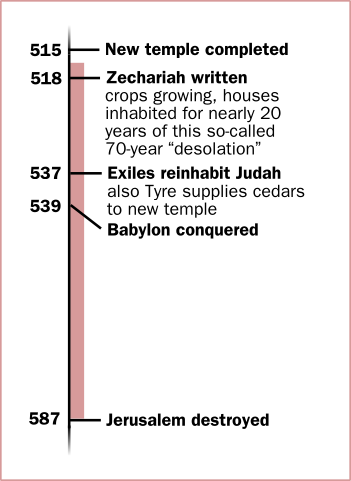 —See the accompanying chart for a comparason with Biblical chronology. The first thing you may notice about such a theory is that it totally and utterly contradicts the first theory we have been talking about – the idea that the desolation began in the 3rd year of Jehoiakim, with the fictitious exile they claim happened in that year. Surely, you would think, that apostates are sharply divided about what “actually” happened. You would be wrong. The same people use both arguments – while fully aware that both theories contradict one another, and therefore they are, in fact, contradicting themselves. The reason is that they have one goal: to attack the Watchtower Society and Jehovah's Witnesses. They couldn't care less how the 70 year prophecy was (or was not) fulfilled, they don't care about any pursuit of truth (although they may put on a false piety pf searching for ‘truth’). The only important thing is that the Watchtower Society is “proved” wrong, and little else matters. That is why they openly contradict themselves. Those words were said between 520 and 518 BCE, almost 70 years after Jerusalem was destroyed in the secular time-line. Hence, apostates can claim that 587 was the true date of Jerusalem's destruction, and that the foretold 70 years was still continuing according to those verses above. However, apostates often take scriptures out of context, and this is no exception. At the start of Zechariah, Jehovah warns the repatriated people not to become like their evicted ancestors, who refused to listen and were punished. They do, in fact, need to show zeal for Jehovah and complete the rebuilding of the temple. Next, Zechariah has a vision where men on horses walk about the earth. They report back saying, “We have walked about in the earth, and, look! the whole earth is sitting still and having no disturbance.” Yes, the nations are currently quiet. They are not concerned about the rebuilding of Jehovah's temple, mainly because it isn't happening. The Jews are being lazy and neglecting the work. There is a fear they may become just like their forefathers. Stop and think about this statement. Doesn't it seem odd that the angel would ask Jehovah “how long”, when the exact length of time had already been determined, namely 70 years? The only possible reason to ask such a rhetorical question is because the 70 years had already ended. Yet, by all appearances Jerusalem was still in a partially desolated and ruined place in desperate need of rebuilding, indeed the temple was still not completed! Jehovah himself answers the angel's question. he says, “I have been jealous for Jerusalem and for Zion with great jealousy. With great indignation I am feeling indignant against the nations that are at ease... My own house will be built in her... My cities will yet overflow with goodness” Yes, Jehovah will show favor Jerusalem and the temple will be rebuilt and blessings will flow to God's people. Now let's take a wider look at the verse in Zechariah chapter 7. Throughout the 70 years of desolation, and since the repatriation, the Jews have kept festivals of fasting, commemorating their sorrow over the destruction of Jerusalem. One day, men from the city of Bethel come to the prophet Zechariah and ask, “Shall [we the people of Bethel] weep in the fifth month, practicing an abstinence, the way I have done these O how many years?” Notice that they do not specify that it was 70 years only. For the commemoration had continued on now for an additional 17 years. The answer then comes from Jehovah in verses 5 to 7, “Say to all the people of the land and to the priests, ‘When you fasted and there was a wailing in the fifth month and in the seventh month, and this for seventy years, did you really fast to me, even me? And when you would eat and when you would drink, were not you the ones doing the eating, and were not you the ones doing the drinking?” Clearly Jehovah is talking of the past, “when” they fasted during the “seventy years”. The 70 years was not continuing, although their fasting in the same manner had continued just the same. Jehovah continues, “Should you not obey the words that Jehovah called out by means of the former prophets, while Jerusalem happened to be inhabited, and at ease, with her cities all around her". Jehovah's words are merely pointing out how much better obedience in the first place would have been than the later fasting over the calamity. Notice that God's words actually takes them back in time and reminds them that if they had simply been obedient when the land was still inhabited before the calamity, then the 70 years of desolation would not have occurred. If the the fastings and commemorations were really for Jehovah rather than their own sorrow, they would be obedient. The rest of the chapter reminds them of just why the desolation came upon them. When we look at the context, coupled with the previous information that the land was to be desolated, uninhabited, ruined, and a wilderness for 70 years, we can see that the 70 year desolation was not continuing. It ended when they Jews were repatriated in 537 BCE, and began when Jerusalem was destroyed 70 years earlier in 607 BCE. This theory contradicts the previous ones. The context of the verses show the 70 years were in the past.